Home » Blogging Basics #4 – How To Monetize A Blog? Blogging Basics #4 – How To Monetize A Blog? 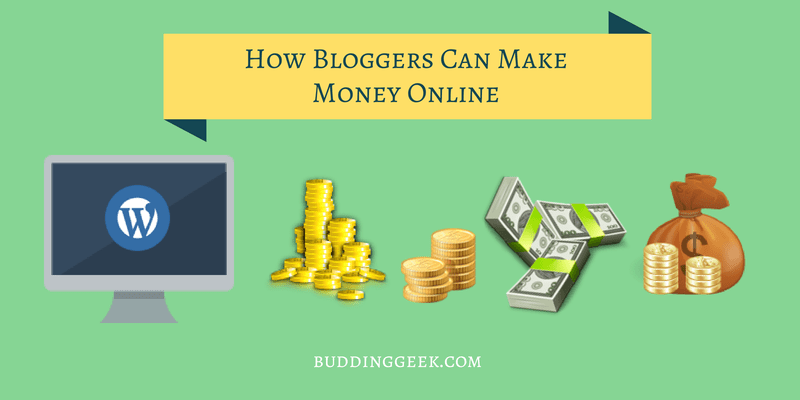 You must have heard or even seen someone making money from their blog. Sure, it’s one of the best rewards that a blog can reap over a course of time. But, how should you approach the concept? Today’s post is an attempt to acquaint all my fellow newbie bloggers to the concept of monetizing their content online. When it comes to monetizing any piece of content online – all that you’ll need is a consistent and loyal stream of TRAFFIC TO YOUR CONTENT. Nothing else! Period. OK, let’s start by drawing an analogy with some offline businesses – Do you think a coffee shop can survive without anyone coming to the shop? Will it be able to make any money? Do you think colleges and universities can make any money without students enrolling in their courses? Definitely NOT! Businesses built online are no different. Your blog can never make any money without people visiting your blog. You’ll be needing traffic any day if you intend to monetize your blog. The concept is pretty simple! Ads are ubiquitous these days. You see them between your favorite TV shows, in newspapers, on the billboards. Turn around and see, they are everywhere! No wonder, ads on blogs are not an exception. The ads that you see on various websites can be classified into two broad types – indirect and direct. Indirect ads are those that are served randomly on your website by an ad-network. They are mostly contextual – that is, random ads are shown on your web page related to the content on your page. For example – if you’ve written something about android phones, then expect ads related to phones and tablets. When it comes to indirect advertising, AdSense by Google is perhaps the first name that comes to my mind. To get started with AdSense, you need to send an online application to Google. They’ll review your application and if your site matches their quality standards, you can join their ad network as a publisher. Google AdSense is a very reputable program because it actually pays and it is backed by the brand name – Google. But unfortunately, getting into their ad network is certainly not a cakewalk because their review team goes by very strict quality guidelines. Click here to navigate to the eligibility requirements to become their publisher. Another way to monetize your blog is by referring products and services of a company to your readers. You earn a commission only when your referral ends up buying products on the company’s website. So, if your referrals are not generating any sales for the company, you’re not earning anything! My blog is not a review centric blog – Only a detailed and cogent review that’s bold on the rhetorics is able to compel its visitors to buy the recommendations! I don’t have a huge & loyal readership yet – People will buy recommendations only from whom they either know personally or whom they trust to be an authority on the subject. As your blog will grow over a course of time, you’ll start getting requests for sponsored posts/reviews from the PR/marketing departments of various companies. They do this to promote their products/services among your readers. Yes, this is similar to advertising, but it’s a different kind of, where you are required to publish a post containing a link back to their promotional page and in return they pay you money. Sounds cool, huh?? But remember to be very careful while taking such opportunities. Don’t go for the offers that fall outside your niche. Advertorials that are completely off-the-track may irritate your readers. Secondly, you’re at the risk of loosing your readership, should you overdo publishing these advertorials. Personally, i feel that doing sponsored posts/reviews is fine, provided that you’re staying relevant and that you’re not overdoing it. Another great way of monetizing your blog is by selling your own e-products. By e-products, i mean – e-books, CDs, softwares and the like. But that requires you to build a huge and loyal readership first – readers who listen to you, who value your advice and most importantly, readers who love you! If you’ve already established yourself as an expert and authority in your niche, you can easily diversify your blogging income by becoming a paid consultant. For example, one can charge for providing WordPress learning courses for beginners, an SEO expert can charge for reviewing, grading or optimizing websites and an expert designer can charge for providing custom website templates/themes. The possibilities to make money are endless. But the keyword here is – ‘being an authority’ in your niche and that authority must be recognized and well perceived by your readers! And, The Post Ofcorz.. Very Informative! Hi @abhishek_google:disqus, nice graphic presentation of all online money making methods. Good article Abhishek and I believe it’s good if one focus on product building and online market is growing and having a product right now will help for better future. Hey Prateek. Thank you so much for the compliments. Yes, I’ve switched to self hosted WordPress finally! Blogger was limiting my blog to reach its full potential. When it comes to being professional in blogging, self hosted WordPress is the only way to go! How’ve you been? How’s your blog? One question though – How can one attract direct advertisers to his website? Daniel, thanks for your comment. To attract direct advertisers to your website, make sure that you already have an “advertise here” page published on your blog, where you can show – why your blog is “worth it” for them to advertise. It works!